On May 28, 2014, the Pennsylvania Supreme Court published two opinions about whether juries could hear from experts. In Commonwealth v. Walker, the Court said an expert could tell the jury about the traps and weaknesses involved in eyewitness witness testimony. But in Commonwealth v. Alicia, the Court said an expert could not tell the jury about problems with the truthfulness of confessions. Each opinion featured a different 4-2 vote among six of the Court’s Justices. This juxtaposition seems so bizarre that the press in our state has noticed. How does one court, on one day, publish two opinions on virtually the same issue, and end up facing in two completely opposite directions? The explanation that jumps out from the opinions is the recognition of research and science. In the Walker majority opinion, Justice Debra Todd discusses how much scientific work on eyewitness testimony has taken place in the last twenty years, since the Court last examined the issue. In those decades, she says, “advances in scientific study have strongly suggested that eyewitnesses are apt to erroneously identify a person…when certain factors are present, ” and she cites the 2011 opinion of the New Jersey Supreme Court in New Jersey v. Henderson, widely regarded as one of the leading cases on the subject. The scientific consensus is strong: “it is beyond serious contention that the statistical evidence on eyewitness inaccuracy is substantial…” Over the course of the last thirty years, forty-four states have recognized this scientific work and decided that trial courts may allow experts to testify about the problems of eyewitness identification. Ten of the eleven U.S. Courts of Appeals have done so as well. (False eyewitness identifications have occurred in almost seventy-five percent of all DNA-based reversals of wrongful convictions.) Thus Justice Todd and the other Justices in the majority in Walker said that Pennsylvania must recognize the evidence that science has brought to bear. In contrast, what does the Alicia opinion say about the science on the interrogation of suspects, and how various interrogation techniques may lead to false confessions? (False confessions have occurred in about twenty-five percent of all DNA-based reversals of wrongful convictions.) Considerable scientific consensus exists on these issues as well; the leading scientists who work on the issue of false confessions published a standard-setting white paper, “Police-Induced Confessions: Risk Factors and Recommendation” for the journal Law and Human Behavior five years ago. Somehow, this scientific work never even comes up in the Alicia opinion. It is as if the research on false identifications simply does not exist. Chief Justice Ronald Castille is at least consistent in these two cases: he wants no experts in court on either eyewitness identifications or confessions, so he dissented in Walker and joined the majority in Alicia. Castille’s dissenting opinion in the Walker case gives us some insight into the thinking of those who want none of this science before the jury. In his dissent, Chief Justice Castille scorns the very idea that there could be real scientific work on these subjects. Indeed, he puts the words science or scientific in derisive quotation marks eight times in just the first three pages of his opinion. While he admits that “a properly trained chemist can usually reliably explain the chemical composition of a substance,” science about human beings cannot claim any reliability: “studies of human beings, human nature, human perception, and human recollection inevitably have a heavy dose of subjectivity.” Justice Castille’s position betrays a strong misunderstanding of what science is, and of the process of doing scientific work and of using the scientific method to test a hypothesis. The real question is not whether we are dealing with so called “hard science” — work done with beakers and bunsen burners. Rather, the question is whether the work is done reliably and rigorously, according to the scientific method, and in accord with principles and protocols that protect against human biases in the laboratory. So for now, juries in Pennsylvania will have to do without the best scientific knowledge on why we might have false confessions. But, even more important, the issue of whether experts can testify on these subjects is not a new one; courts in most jurisdictions resolved this issue years ago. Instead, every institution that forms part of our criminal justice system in PA should be focused on prevention: establishing protocols for police to follow that will keep dangerous mistakes eyewitness testimony and interrogation from happening in the future. The research is there; the best practices are known. Nevertheless, we remain stuck in the past, arguing about expert witnesses. Tags: crime lab, criminal justice reform, Department of Justice, failed evidence, failed forensics, forensic, forensic science, forensic testing, NAS report, National Academy of Sciences, National Commission on Forensic Science, National Institute of Standards and Technology, NIST, science, Strengthening Forensic Science in the U.S. The commission will have responsibility for developing guidance concerning the intersections between forensic science and the courtroom and developing policy recommendations, including uniform codes for professional responsibility and requirements for training and certification. The new initiative provides a framework for coordination across forensic disciplines under federal leadership, with state and local participation. The Department of Justice, through its involvement in the commission, will take an active role in developing policy recommendations and coordinating implementation. For many who looked for action in the wake of the National Academy of Science’s 2009 report and saw very little, the creation of the commission will comes as a welcome step forward. The National District Attorneys Association (NDAA), which took a fairly negative view of the 2009 report and its recommendations, is now reacting with a wait and see attitude. The NDAA has not yet put out a formal statement in reaction to the announcement of the commission; according to Scott Burns, the Executive Director of the NDAA, the organization will do that once it gets the details on the commission, especially its composition. So far, Burns told me, the NDAA is “encouraged” by the fact that prosecutors will be part of the commission, though he stresses that he hopes to see more state and local prosecutors than federal ones. Burns said that if the commission begins with the attitude that “the system is broken” and that its basics — fingerprints, tool marks, and the like — must be fixed, the NDAA will not look on it favorably. On the other hand, if the commission starts with the attitude that “we can improve” the system but that it basically functions well, that would be welcome. I will write further on this as the story develops. Although science has long been recognized as our most reliable pathway to truth, people are sometimes reluctant to accept scientific evidence, particularly when it challenges established practices or cherished beliefs. In Failed Evidence: Why Law Enforcement Resists Science, David A. Harris accuses police and prosecutors of unwarranted skepticism toward science and tries to explain their perspective. His provocative book will interest those concerned broadly with rejection of science as well as those interested in the U.S. criminal justice system. Science is published by the American Association for the Advancement of Science. A decision by Oregon’s Supreme Court on eyewitness identification procedures has re-set the way that juries and courts in that state will think about eyewitness identification. According to the New York Times editorial on the case, the ruling shifts the burden of proof to prosecutors to prove that eyewitness identifications are reliable before they can be admitted in court. Before last week’s decision, the rule had been that identifications were generally admitted; it was up to the defense in individual cases to prove that an identification was not reliable. But at least as important as the new rule itself was the reason that the Oregon court abandoned its old precedent: the court had concluded that the old rule was based on assumptions about eyewitness testimony no longer supported by the science. Thus the new case represents a textbook case of a court forcing law enforcement away from the failed evidence of discredited methods, and toward methods that accord with what science teaches us now. Under the old rule, Oregon judges looked at five factors when evaluating an eyewitness identification: opportunity to view the alleged perpetrator, attention to identifying features, timing and completeness of description given after the event, certainty of description and identification by witness, and lapse of time between original observation and the subsequent identification. Looking at these factors from the vantage point of the present day, the Oregon court found them “incomplete and, at times, inconsistent with modern scientific findings.” Given the science on eyewitness identification that is by now well established, the court prescribed a new approach, including the change in the burden of proof. 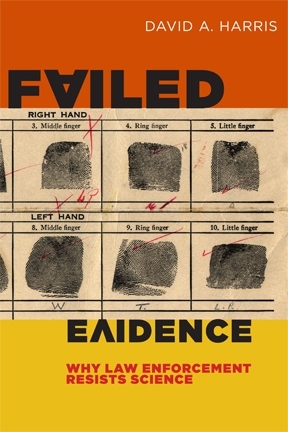 …[W]e believe that it is imperative that law enforcement, the bench, and the bar be informed of the existence of current scientific research and literature regarding the reliability of eyewitness identification because, as an evidentiary matter, the reliability of eyewitness identification is central to a criminal justice system dedicated to the dual principles of accountability and fairness. It’s hard to imagine a better summing up of the ideas behind Failed Evidence, and why the fight to overcome law enforcement’s general resistance to science is so important. [The] image of a deep alliance between police work and modern science is misleading at best. With the exception of DNA work and certain kinds of classic chemical analysis, law enforcement generally does not embrace existing scientific work. In fact, police and prosecutors in the US resist science. The scientific work I am referring to involves the testing of the more traditional techniques of law enforcement investigation and prosecution: not the high-tech sheen of the DNA lab, but scientific testing of eyewitness identification, the interrogation of suspects and the more traditional forensic methods such as fingerprint identification. This is the daily bread and butter of law enforcement, and scientists have found it wanting. The science on these basic police investigation methods has existed for years — some of it for decades. It is rigorous, and has undergone peer review, publication and replication. It tells us what the problems with traditional police work are, and also gives us some straightforward ways of solving these problems. Yet, most — not all, to be sure, but most — of American law enforcement continues to resist this science and refuses to change its basic tactics to reflect the best of what science has to offer. Jurist mixes straight reporting and commentary from the U.S. and around the world; it’s a great source for anyone interested in issues of justice and how it plays out in domestic and international situations around the world. (Full disclosure: Jurist is supported by my own institution, the University of Pittsburgh School of Law, and has been guided and run since the beginning by my esteemed colleague, Professor Bernard Hibbitts.) Check it out.